Over time a hardwood floor finish begins to dull and can show signs of wear such as scratches in the finish. If you are renovating your house or a specific room, refinishing your floors should be the last thing you do. Hardwood refinishing can take a week or longer and we recommend that you do not stay in your home during the project due to the dust and odors as a result of the sanding, staining and finishing process. Customer removes all their electronics, knick-knacks, cords, etc. from the space prior to starting. Our installers will remove the furniture. For hardwood refinishing, everything needs to be removed from the floors. Sanding. 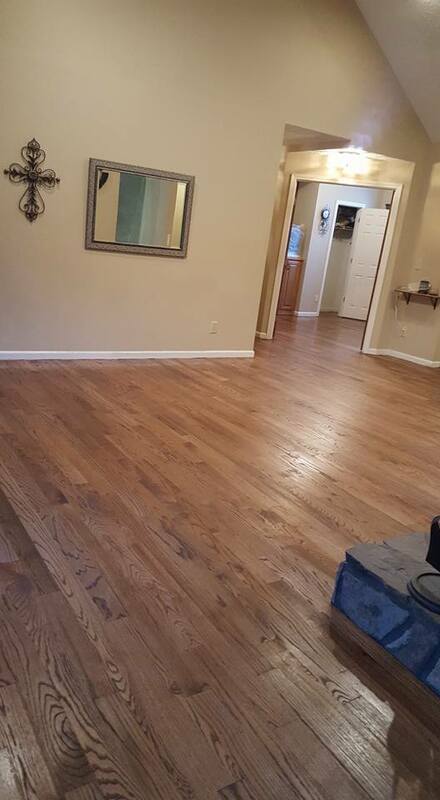 The floor is sanded which removes the topcoat and stain. We are left with the raw, solid hardwood. Staining. You can choose a ready-mixed color (Min Wax) or you can customize your color (75% Dark Walnut and 25% Mahogany) to create the perfect color for your choice. Polyurethane. Next we begin the process of applying the top coat finish. We recommend 3 coats of finish. There is drying time between coats and can vary based on product and humidity. This is when many people get anxious to move back in their space but we highly recommend waiting to get the extra coats applied. Drying Time. You can put furniture back in 24 hours but rugs can’t be placed back down for 28 days to allow the finish to cure. When placing furniture back on the floors, you do not want to slide the furniture along the floors. You should pick up the furniture and set it down in place.